Although I might be most comfortable in Wranglers and a plaid shirt, I do love to step it up a notch to share the true beauty of ranch life. 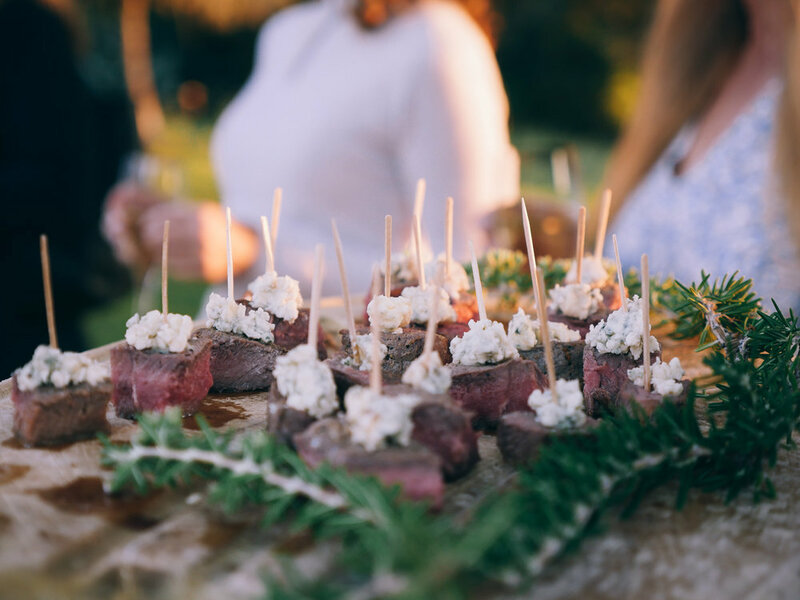 So, for the last of our 2018 ranch events, or “Gatherings,” I decided to host a dinner that showcased the elegant side of California ranch life. What better way to do this than a wine-focused dinner? 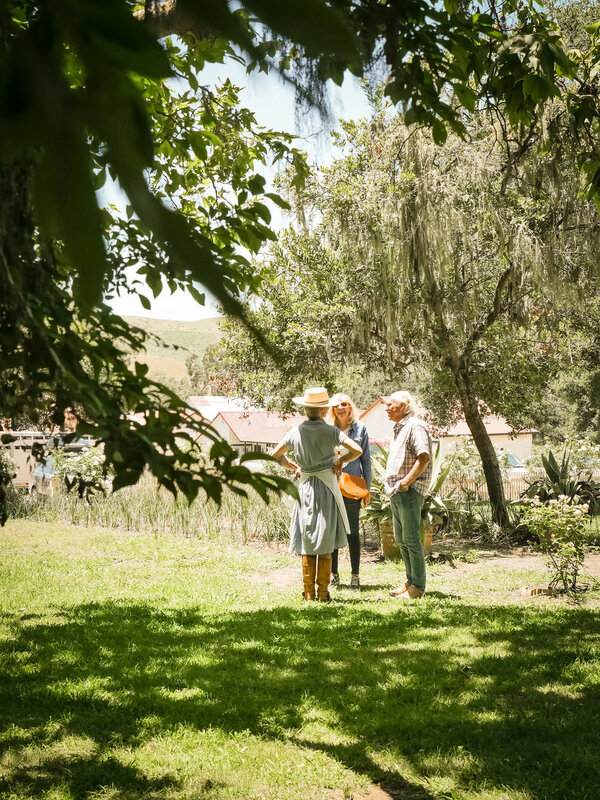 On November 11th, 2018, I invited our dear family friends, Richard and Thekla Sanford, to come to Rancho San Julian and talk to us about their story and their very long history with wine and agriculture in the nearby Sta. Rita Hills. The event began at sundown, when we gathered on the front lawn of the “Casa,” the old house that is our ranch headquarters. Richard raised a glass of his Alma Rosa 2015 Brut and toasted to the year that had past and all that is to come. As the light dwindled, our guests walked the grounds with my father, Jim Poett, and he told us about how and when the house was built, in three different sections, over the course of almost 100 years. 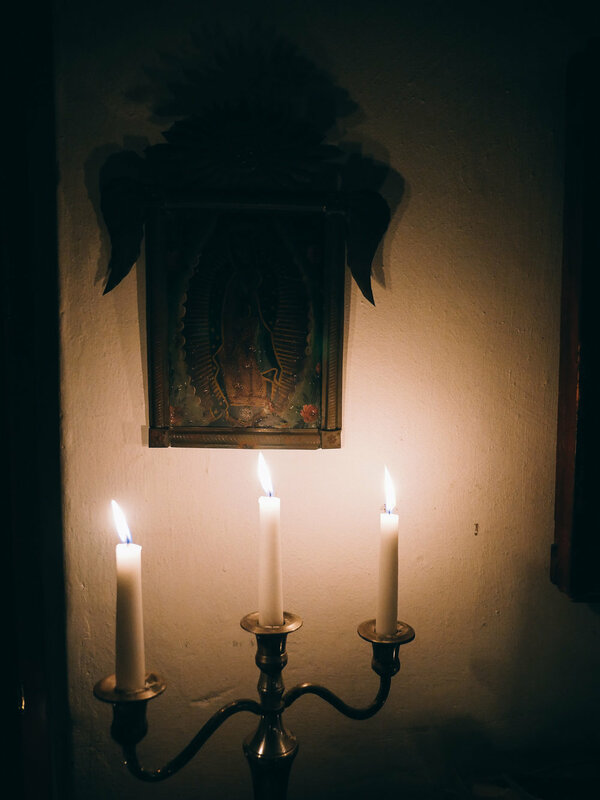 Dinner was held in the oldest part of the house, the “Cowboys Dining Room,” which was built around 1820 and has adobe walls, stone floors, and a warm, open fireplace. My friends Katie Rose Hames and Blakeney Sanford had helped me decorate this beautiful and sacred space with natural treasures that we found around the ranch, including some of the heirloom pumpkins, ears of rainbow corn, and dried corn leaves that we had grown in the Rancho Pumpkin Patch. Katie Rose and I prepared the meal, and Richard and Thekla generously provided wines from Alma Rosa Winery. The meal began with a ginger pumpkin soup with fresh croutons served in a pumpkin, and a fresh market salad with persimmons, pomegranate and a citrus dressing, all paired with a 2015 Chardonnay - El Jabalí. This was followed by braised Rancho San Julian short ribs with whipped garlic potatoes paired with two wines, a 2016 Pinot Noir - Bentrock and a 2015 Pinot Noir - Sta. Rita Hills. The meal ended with a rich chocolate cake served with honey cream on the side. It was a true honor to have both Richard and Thekla Sanford around our table. They have been true pioneers in the Sta. Rita Hills and their love for this valley and dedication for excellence has always inspired me. This was a dinner I will remember for years to come, and I am so grateful to all who made it possible. Please be sure to check out Gatherings for upcoming events. We hope to host you on the ranch soon! One sunny Sunday this past September, we gathered to celebrate the end of summer and the beginning of fall on Rancho San Julian. I had invited my talented friend Carmen Ruez de Huidobro to join us to show us how she makes her delicious paellas. Carmen, who was born and raised in Madrid, Spain, now resides in Los Angeles with her handsome husband and two adorable children. We met many years ago, immediately connected, and have been dreaming of working together ever since. This paella event was our dream, come true. I also invited a very talented local artist, Viktoriya from FOLD, to come and share her talents. Together we set a beautiful table with freshly cut flowers and greenery from around the ranch and Viktoriya's beautiful table linens. After a lively, hands-on paella class (and some gazpacho), the guests joined me for a tour of the grounds and a discussion about life on a working cattle ranch. We ended the tour under the century old arbor, where we ate our seafood and chicken paellas, along with a green citrus salad from our garden and fresh bread, accompanied by delicious, locally-made granacha and albarino wines from Pierre LaBarge and Brad Potter of LaBarge. 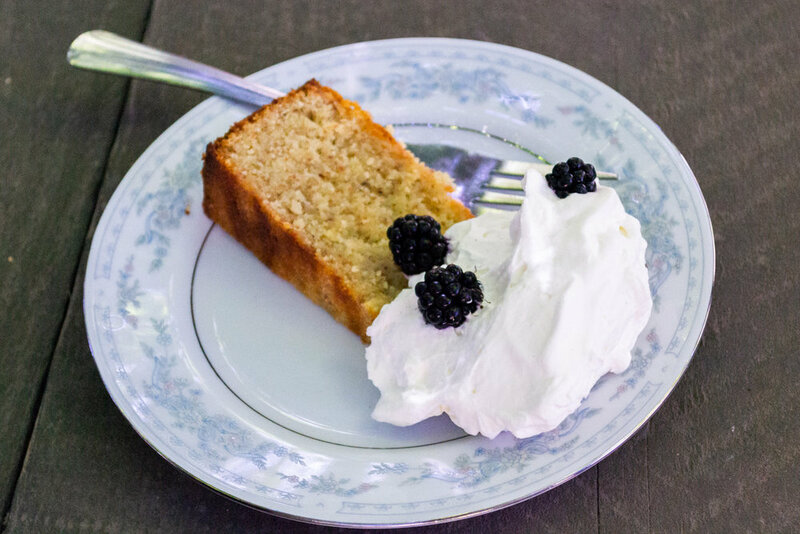 As the sun began to set behind the hills, we served hot coffee and almond cake with whipped honey cream, and I toasted everyone who had come to share in this beautiful celebration of our last summer harvest. Be sure to sign up for our mailing list to hear more about our upcoming gatherings! Once the calves are born, they will be up, standing, nursing, and learning to walk within the first hour of life. Once the mother feels like her calf is strong enough, she will walk it out to show it off and to meet the other mothers and new calf friends. It is so much fun to be able to see these new calves smell and play with each other. After a few days we'll see them running and kicking their back feet up into the air. 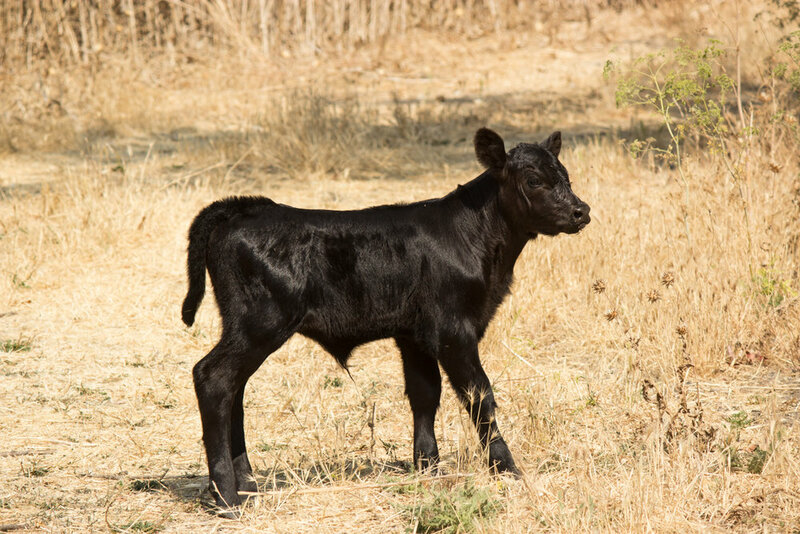 If a calf travels too far from its mother, the cow will be quick to call it back, and the calves are usually very good and coming at once and following their mother’s tail wherever she may lead. Another one of my favorite sights is when one or two mothers watch 10-15 calves while the other mothers travel farther for better feed. The mothers take turns babysitting the calves like this. Sound familiar? Calving season has been particularly fun this year because my own little ones are now old enough to understand what is going on and to come with me to check on all the new calves. In the first week of August of every year, Santa Barbara celebrates Old Spanish Days Fiesta! It is a time when the town remembers its heritage and history. It has always been my favorite time in Santa Barbara. I began to be involved as a flower girl when I was seven and later danced flamenco in a company for many years. I was so lucky to be able to dance on the Mission steps, in the Courthouse Sunken Gardens and at in front of the de La Guerra Plaza where my ancestors once resided. I loved going to the parade, which is the largest equine parade in the United States and of course going to the Rodeo. Along with the dancing and horses, fiesta is not complete without good food and a margarita. Here is a Santa Rosa Plum Margarita that was just featured in the Martha Stewart Living. Enjoy responsibly! Viva la Fiesta! Bring sugar, plums and water to a boil in a small saucepan. Remove from heat and let stand for 20 mins. Strain and let cool. Pour in an airtight jar and it will last up to 5 days in a fridge. Combine syrup, tequila, and lime juice in a pitcher. Pour salt onto a small plate. Wet the rim of the glass with a lime wedge, fill cup with ice and pour margarita mixture over the ice. Garnish with the lime. 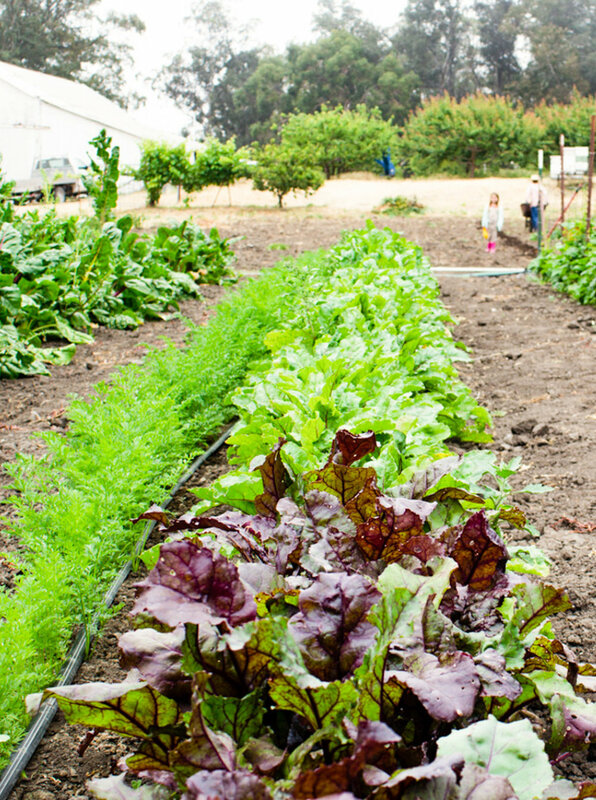 For many years Rancho San Julian has had a pretty large vegetable garden. Some years we have used the garden just for our family meals, some years we've sold produce, and some years we've planned the garden specifically so that we have lots of ingredients to make pickles and preserves. This year I pulled together everyone who lives or works on the ranch and organized a Community Garden under the direction of Chris Thompson and Katie Hames. Since late May we have been meeting about once a week to plant, weed, water, and harvest vegetables. It has been some of the most fun I have ever had in the garden: we all pitch in, learning and having fun conversations while working while the kids run wild and have their own fun. 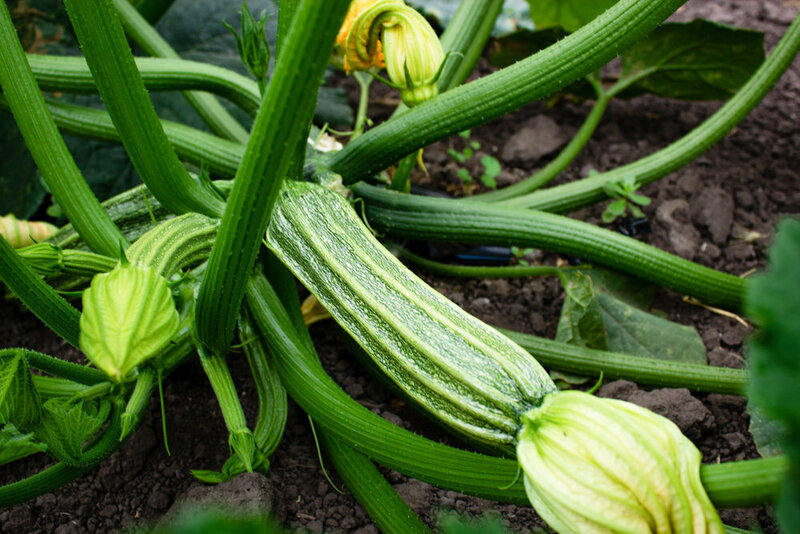 Right now, our summer squash, zucchini, carrots, and beets are starting to come in, so I see a lot of fun zucchini breads in our future! If you have a zucchini, carrot or beet recipe that you would like to share, please send it to me with a photo; I would love share your work on The Ranch Table! This is the most basic but a forever classic, strawberry jam recipe. I love making lots this season since the kids are huge fans and there is nothing like homemade jam ready and on hand. In the last Ranch Table Gathering my dear friend Katie and I showed some fun tricks of the trade. This is the most basic but a forever classic, strawberry jam recipe. I love making lots this season since the kids are huge fans and there is nothing like homemade jam ready and on hand. 1. Wash the strawberries, remove the tops, and cut them into quarters. 2. Mix the strawberries, sugar and lemon juice, and set everything in fridge overnight. 3. Put the mixture in heavy bottomed pot and slowly bring it to a boil over medium heat. Stir frequently. 4. As the jam thickens, lower the heat, and stir more often to prevent sticking. 5. The jam is ready to can when it slides off of a spoon in a sheet rather than dripping off. 6. 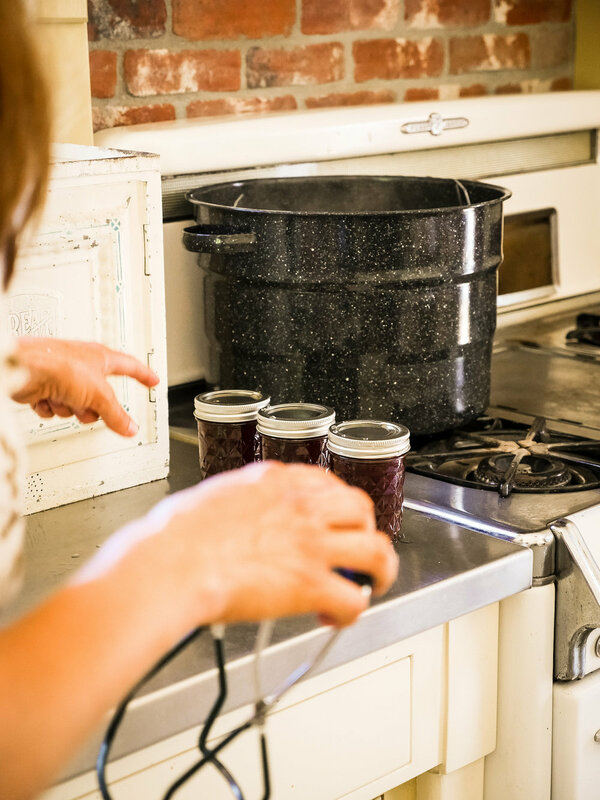 Turn off heat and ladle the hot jam into prepared canning jars. Leave ¼ inch of headspace. 7. Process the jars in boiling water for 10 minutes. 8. 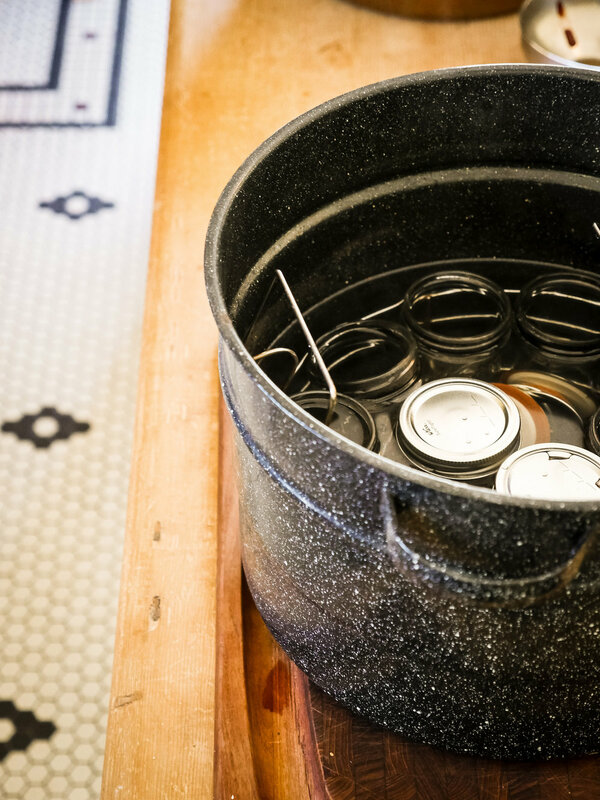 Take out jars carefully and let sit for 24 hours so jam sets and lids seal. Once you have mastered making traditional strawberry jam, it is fun to try adding an aromatic flavor by way of adding a few sprigs of an herb or a spice to infuse in the jam. For example, adding a split vanilla pod to the pot will give the jam a lovely vanilla bean flavor. Favorite herbs to add (only one kind per batch) are Bergamot mint and Lemon Verbena. Remove the stems and leaves before canning. Hope to host you on the ranch soon! 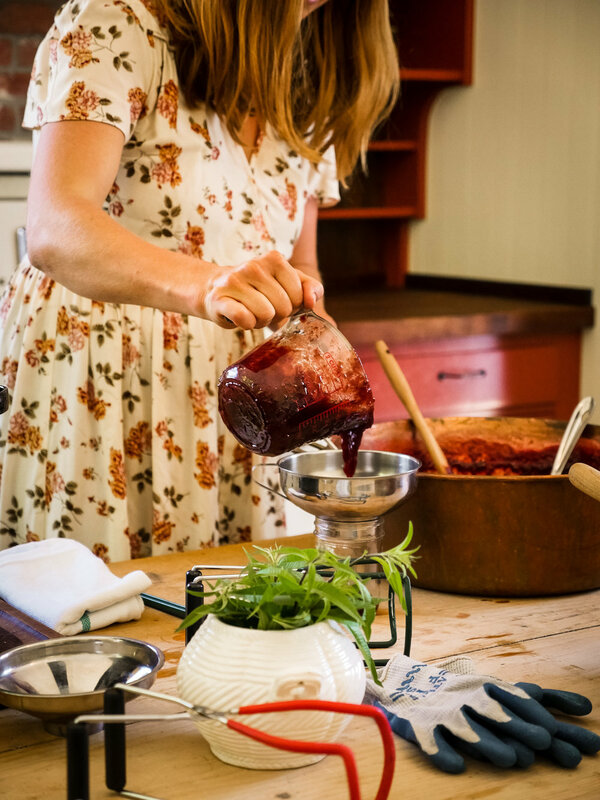 This past Sunday, June 3rd, on a perfect, sunny afternoon, we celebrated the start of strawberry season with a strawberry jam cooking class at Headquarters of the Rancho San Julian. Katie and I gathered under the large oak trees to introduce ourselves while we sipped strawberry lemonade and iced tea with our guests. 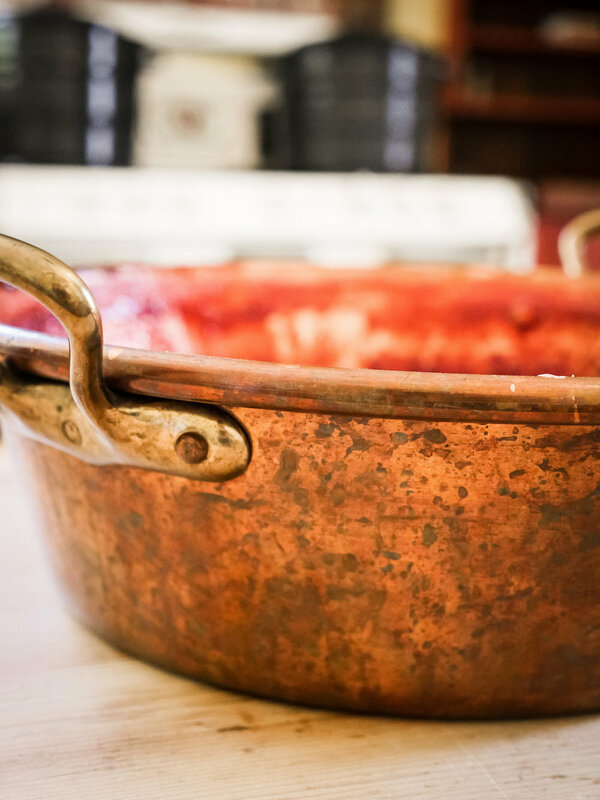 We then proceeded to the Ranch Headquarters Kitchen where we taught the art of making classic strawberry jam. 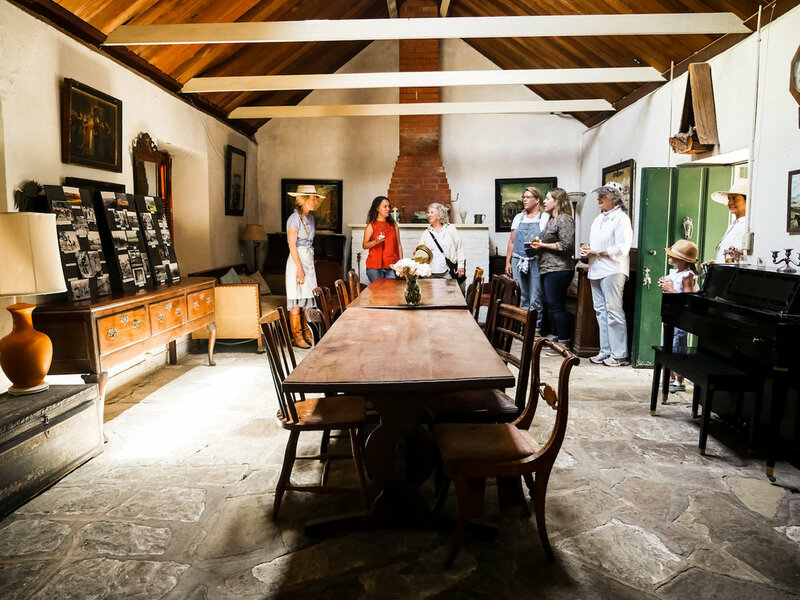 After cooking we toured the grounds of this historic ranch and shared stories of California history and ranch life. The afternoon ended with iced tea and strawberry short cake enjoyed under the 100-year-old wisteria and grape arbor. It really was a beautiful afternoon on the ranch. Check out Gatherings for upcoming events. We hope to host you on the ranch soon! This cocktail is the perfect way to celebrate the beginning of summer. Mulberries have a short season, so these delicate long dark red berries are a delicacy for this region. I have found that they never last long at home, so when I get them I usually cook them into a simple syrup to preserve their flavor. Add a few tablespoons to sparkling water or lemonade, or try it in this delicious cocktail! Put all ingredients in a heavy pot and bring them to a simmer. Cook, stirring a bit, until sugar has dissolved. Mash the mulberries, then let the mixture continue to simmer for another 15 minutes. Strain the syrup (discarding the solids), and put it into an airtight jar. The syrup will keep, refrigerated, for about a week. Pour the gin, lemon juice, triple sec, and Mulberry Simple Syrup into a shaker filled with ice. Shake the mixture well for at least 30 seconds, then strain it into a martini glass or coupe, add a splash of sparkling water, and garnish with a lemon or Mulberry. Drink responsibly. When I first started selling Rancho San Julian Beef at the Farmers Markets, in 2008, bones were a hard sell. I always had them at the market, because I have always sold the whole animal, but they did not sell well—at the time, customers were more interested in the “fancy cuts” like filet mignon. Thankfully, times have changed. People now see the benefits of bones, and they buy a lot of them, mostly to make bone broth. Today’s focus on the benefits of bone broth may look like a trend, but it’s really a return to our cooking roots. Bones and bone marrow have been eaten for as long as humans have been eating meat. I absolutely love bone broth, but if you wants something super special, try this extremely easy recipe for Roasted Marrow Bones, which are a classic French appetizer—they’re really good for your health, and, more importantly, they’re absolutely delicious. Heat the oven to 450. Put the marrow bones in a cast iron pan, and set them in the oven to roast until they are golden on top, 15-20 minutes. Transfer the hot marrow bones to a serving plate, scatter sea salt and a few pinches of herbs on top, and serve with pieces of toasted whole grain bread and small spoons to scoop out the marrow. If you’d like to serve the marrow bones with caramelized onions, use the time the oven is heating to cut the onion into very thin slices, and while the marrow bones are baking, cook the onion slices in the olive oil over med-high heat, stirring constantly. By the time the marrow is ready, the onion should be soft and golden and starting to crisp just a little. Arrange the cooked onions around the marrow bones before adding the salt and herbs. During a recent foggy Saturday farmers’ market, something was up. The usual friendly faces of shoppers were preoccupied and on a mission. A farmer struggled to put up his sign and then just tossed it into his pickup while a crowd surrounded his stand. I got closer to investigate and then saw why: beautiful baskets filled with deep red cherries. Cherry season, which runs from May to July, is a reminder that school is almost out for summer. Baking and cooking with them is a delight, but sometimes just having a huge bowl in your kitchen is the perfect way to celebrate. Just make sure you get to the market early. “I’ll take four baskets,” a customer said urgently that morning, as if they were the last baskets on earth. One of my favorite recipes is cherry clafouti. Don’t be swayed by the fancy French name — this dessert is so simple and will wow your friends and family! Butter a 9” pie dish. Place pitted and halved cherries in pie dish. In a medium bowl, beat eggs and sugar. Add milk, vanilla, flour, salt, and rum. Pour mixture into pie dish on top of cherries. Place pie in oven for 50 minutes or until pie looks browned and puffy and you can insert a knife that comes out clean. I love the feeling as summer draws to a close and fall begins. The mornings are cool and foggy, the kids are back to school, and the soft afternoon light makes things seem calm and quiet. But that’s not the case for every backyard garden and farm on the Central Coast. If these food plants had an emergency alarm, those sirens would be going off right now! 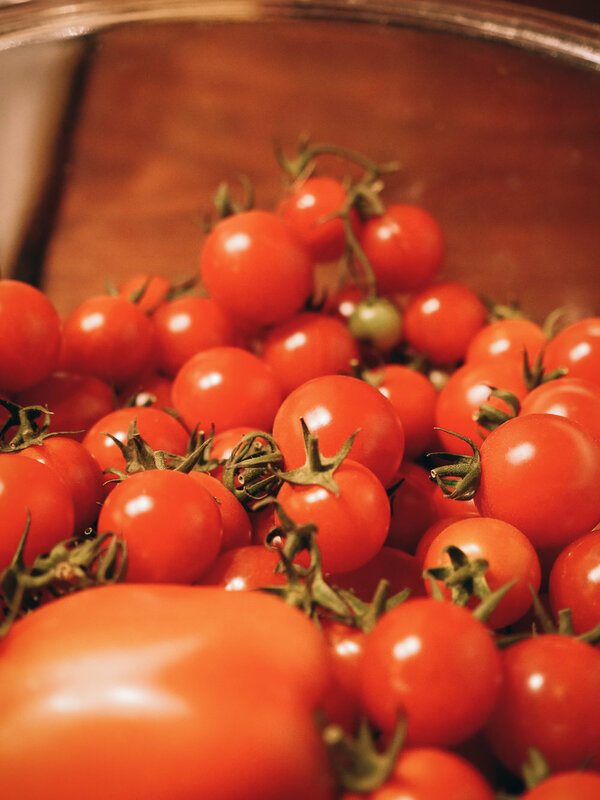 This season is when the farms are bursting at the seams and the farmers’ markets are packed with every variety of summer vegetable imaginable. This abundance is the perfect moment for making salsa. I prefer to make a huge batch every year so my family can taste this incredible season all year long, but here is a quick recipe that will be perfect for the long-awaited football games and weekend picnics. Add all the ingredients into a food processor or chop by hand. Pour in a container, put in your fridge, and eat within a week. “Kuplink, kuplank, kuplunk!” My 5-year-old is chirping with the biggest grin as he drops three blueberries into his pail while we pick our own from Santa Barbara Blueberries at Restoration Oaks Ranch, which is open the entire blueberry season from May to August. You can’t miss the signs as you head north on the 101 about 10 minutes south of Buellton. As I drive up to a nicely shaded farm stand with my two happy sons, a very friendly woman waits to help us. She points out rows that are ready to pick and sends us on our way with three tin pails. My 5-year-old flies to the rows of bushes with his pail swinging gleefully as my youngest places his pail on his head and smiles. Even as the 101 highway rushes by, there is something quiet and nostalgic about picking your own blueberries and dreaming about all the goodies you want to make. “Will we see the mama bear and the baby bear?” my son asks, recalling his favorite book, Blueberries for Sal, a must-read classic that’s impossible not to think about while picking. “Not today,” I say, as we carry our pails back to the farm stand, with thoughts of blueberry muffins on my mind. Find my recipe for blueberry muffins at independent.com/food. Santa Barbara Blueberries is located at 1980 U.S. Highway 101 in Gaviota, open 10 a.m.-6 p.m.. See santabarbarablueberries.com. I love blueberry muffins, but mornings are busy. Here is an easy way to prepare everything the night before. In a large bowl, mix the flour, baking powder, baking soda, and salt. In a medium bowl, beat butter and sugar until mixed well. Add eggs, buttermilk, and grated lemon peel to butter and sugar mixture. Pour buttermilk mixture into large flour bowl. Lightly flour blueberries, and gently fold them into muffin mixture. Portion mixture into greased muffin tins. Top muffins off with brown sugar. Cover tightly with plastic wrap, and place in fridge overnight. In the morning, set oven to 350°F and bake for about 30 minutes or until tops are golden.